We are committed to providing a product and service accessible to all who desire a great environment and high quality food/drink. We believe in using local, organic and artisan products whenever possible. At Rocco’s, we make as much from scratch as possible. This includes all our sauces, dressings, dough, ricotta, sausage, as well as many bar items. Some of our sources include Field Roast, Olsen Farms, Zoe’s Artisan Cured Meats, Collin’s Family Orchard. Organic arugula, fresh raspberry vinaigrette, pear, goat cheese, pistachios. Amazing pizza! It looks expensive at first but the pizza is huge. The five of us spent $15 each on pizza and appetizers and were very full. Great experience and customer service... we would definitely go back. Amazing! One of the best pizza joints on the planet — seriously! Rog and the whole crew just do a spectacular job at serving their customers as they were their own family/friends. Food and service were great! Special thanks to Roger, who was very kind with us! Food & drinks were great, and they went above & beyond for our birthday celebration. We've been here before during dinner and happy hour, so we knew the significance of making a reservation (even at 5pm). The pizza was amazing, as always. Staff very friendly and knowledgeable. And the new cocktail list sparked our interest, to boot. Anyone who loves pizza needs to make a stop here! Everything about Rocco’s is enjoyable - the decor, the vide , the staff and of course the food! Be sure to try the meatballs! If you like fantastic food, efficient, cheerul professional service, and wonderful people, go to Rocco's. Worth a visit. Pizza’s are huge portions. One slice is lots for 1 person. All staff very friendly and efficient. Food is outstanding. Service needs a bit of work. Our waitress abruptly left without saying anything. Thus our drinks were not refilled and we were not offered dessert etc. Pizza is so delicious....cannot complain! Service was very good as well....! Great pizza, excellent service and neat atmosphere. I took 4 teenagers here for dinner before a show and they all really enjoyed it. Fantastic pizza, great service, AWESOME decor, super busy and after one taste of nearly anything on their menu, you'll know why. Reservations are a MUST. Half pie is 4 slices. One slice and a shared appetizer is a full meal and i'm not a small guy. Will be coming back to try other pies. Food was AMAZING!! I would most definitely come back! Went as a group of 6 on a Monday night. Had a reservation, which was essential. Table was ready for us, and all the staff we interacted with were friendly, fun, and knowledgeable about the menu and bar list. Between the six of us we had 3 appetizers (beets-nice, cheesy bread-very cheesy, and Brussel sprouts-yum), a meatball (reportedly delicious), and 2 pizzas (which are huge!). Needless to say, we took some pizza home. My New York-born-and-raised husband who always wonders why he can't get good pizza in Seattle was very satisfied and ready to go back. Ordered the shrub cocktail, which comes deconstructed, allowing me to mix it to my utter satisfaction. Other cocktails and wine were also good, if not as impressive in presentation. Loved the music (hits from the 80's & 90's mostly). This was our first visit to Rocco’s, the food exceeded my expectations and service amazing. Although I live in Puyallup, I will make Rocco’s my go to for pizza when I’m in Seattle. Rocco’s is always extraordinary. Excellent cocktails, delicious pizza! We met family from out of town. Stayed at the table for over two hours with no one rushing us. The pizza was just killer. 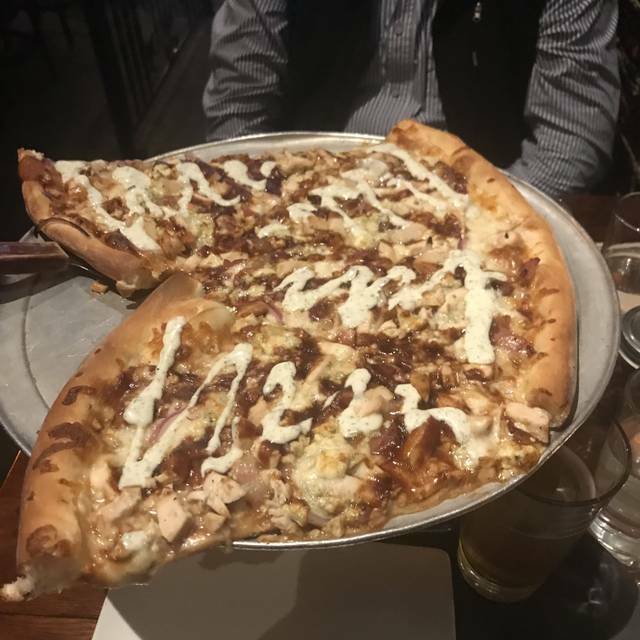 If you like pork them I recommend the "Three little piggies" pizza. We will be back next time we are in Seattle. Very hip, crowded and loud. Extremely expensive. Two appetizers, a few drinks and half a pizza was over $80 with tip. Limited seating, reservations a must for busy times spots. Service was excellent, great interaction with staff and us. Everything from being seated to leaving was just PERFECT. I had never been here before, but brought a friend from out of town and the pizza, drinks, service, all of it... superb. It was a wonderful experience and I will be back! Also, big thanks to Dave for being a wonderful server and surprising is with delicious cocktails. Great atmosphere for pizza and fun drinks. Pizzas are huge! And the appetizers are great and filling. Had the mushrooms and the pear and Brie raviolis. They provided some great cucumber water too at the table. Fun watching the chefs toss the pizza. Food was great. We had a large party of 10, server attention was great and the food came fast and was fantastic. Best pizza in Seattle. Love the aroma as you walk in. You know you are gonna love it just from the smell alone. Loved Rocco’s. Everyone was so friendly. We were a little early for our reservation and were seated right away. Fabulous food and drinks! Can’t wait to eat there again. We made reservations prior to a show, were seated promptly, and made very comfortable. The service and the food were great, as was the flexible attitude when the number in our party kept changing during the meal. We had meatballs, salad, and pizza -- the fresh basil on the pizza was a wonderful aromatic experience. We had a great time and highly recommend Roccos. Had a late dinner on New Year's Eve. Everything was YUM! We had a ball! Great pizza, best thin crust I've found in my 30 years of being in Seattle. I am from Chicago so a bit of a pizza snob. This is by far the best I've found. I bit on the noisy side and as we sat by the front door, a bit cold when people would open the door and stand there looking in. Had made reservations through open table, confirmed my reservation and when we arrived a little early for our reservation, I was told I didn’t have one. Then they told me it was cancelled. They still gave us a table and everything else was wonderful. Great food, awesome drinks. Always make reservations and maybe call and make sure it doesn’t get cancelled if it’s a special occasion. Consistently five star. Food, of course. But, really, with these servers and bartenders, why go anywhere else in Seattle. We really enjoyed Rocco’s. We went on a Saturday night and the place was packed and hopping. Very good pizza and unique, tasty salad! Quite expensive for pizza but it was very good, the pizza was huge, had very generous toppings. Non alcoholic drinks quite spendy ($5 for a pop) but definitely will be back and highly recommend it. We ended up at Roccos because we could make reservations and it was walking distance to the Cinerama (movie theater). Best random decision! The pizza was awesome! Salad was delicious. Good variety of beers on tap. Great cocktails. And non alcoholic yummy drinks available as well. Service was good. We liked the unique ambience and style of the place. We will be back! For drinks, we tried cocktails from the menu, as well as "Bartender's Whimsy" where they just make something up. The non-drinkers at the table tried the made-in-house "Shrub & Soda"- all delicious! For food, we started with Prosciutto Wraps (kind of like pizza sushi rolls? ), Deluxe Garlic Cheese Bread, and Roasted Brussel Sprouts. For mains we elected to order from the By-the-Slice menu (5 options on a Saturday Night) so that everyone could express their preference (vegetarian, chicken, bacon, etc.) Slices came out hot and fast and the bottom crust was thin but not too thin, so the slice holds up to its own weight, even though there were a generous amount of toppings! Yum. Will be back.